The Bimaran casket is a small gold reliquary for Buddhist relics that was found inside the stupa no.2 at Bimaran, near Jalalabad in eastern Afghanistan. When it was found by the archaeologist Charles Masson during his work in Afghanistan between 1833 and 1838, the casket contained coins of the Indo-Scythian king Azes II, suggesting a date around 30 BCE to around 10 BCE. It is also sometimes dated to a slightly posterior date of 50 CE, based on a redeposition theory, and sometimes much later (2nd century CE), based on artistic assumptions. The casket features hellenistic representations of the Buddha (contrapposto pose, Greek himation, bundled hairstyle, realistic execution), surrounded by the Indian deities Brahman and Indra, inside arches niches (called «homme arcade», or caitya) of Greco-Roman architecture. There are altogether eight figures in high-relief (two identical groups of Brahman-Buddha-Indra, and two devotees in-between) and two rows of rubis from Badakhshan. Owing to their necklace, bracelets, and armbands, and aurora, the two devotees might be representations of Bodhisattvas. They hold their hands together in a prayerful gesture of reverence, anjali-mudra. The casket is made in gold-repoussé and is very small, with a height of 7 cm (2¾ in), and is probably Indo-Greek work. It is considered as a masterpiece of the Greco-Buddhist art of Gandhara. 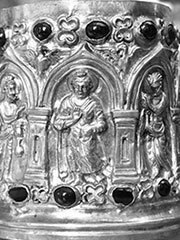 The Bimaran casket was kept in a steatite box, with inscriptions stating that it contained some relics of the Buddha. When opened in the 19th century, the box did not contain identifiable relics, but instead some burnt pearls, bead of precious and semi-precious stones, and the four coins of Azes II. the Bimaran reliquary, which specialists attribute to the Indo-Scythian period, more particularly to the rule of Azes II» (Christine Sachs, «De l’Indus à l’Oxus»). Since the casket already displays quite a sophisticated iconography (Brahma and Indra as attendants, Bodhisattvas) in an advanced style, it would suggest much earlier representations of the Buddha were already current by that time, going back to the rule of the Indo-Greeks, as advocated by Alfred A. Foucher and others. The first representations of the Buddha are generally assumed to be around the 1st century CE, about fifty to a hundred years later than the reign of Azes II, under the rule of the Kushans. For these reasons, it has been suggested that the casket may be a 1st century CE re-deposit inside the stupa, so that its actual date would be later than the coins suggest. In that case though, it is unclear why a later devotee or ruler (1st century Kushan?) would insert the coins of an Indo-Scythian ruler inside such a high-profile and precious dedication. It has also been suggested that the coins of Azes II were posthumous issues, which is highly unlikely as different ethnicity (Indo-Parthians and Kushans) ruled after the reign of Azes II. Stylistically, the Kanishka casket, with an iconography broadly similar to the Bimaran casket, but a much coarser (barbarized?) execution, is securely dated to around 127 CE. The Bimaran casket is on display at the British Museum (Joseph E. Hotung Gallery), which dates the casket to 60 CE, based on the re-dedication theory, supported by the Museum’s curator. Detail of Brahma. Detail of Indra. Detail of Hamsa goose. Detail of a devotee, possibly a Bodhisattva. «Monnaies Gréco-Bactriennes et Indo-Grecques, Catalogue Raisonné», Osmund Bopearachchi, 1991, Bibliothèque Nationale de France, ISBN 2717718257.